You think my two characters could join your team? Thanks. 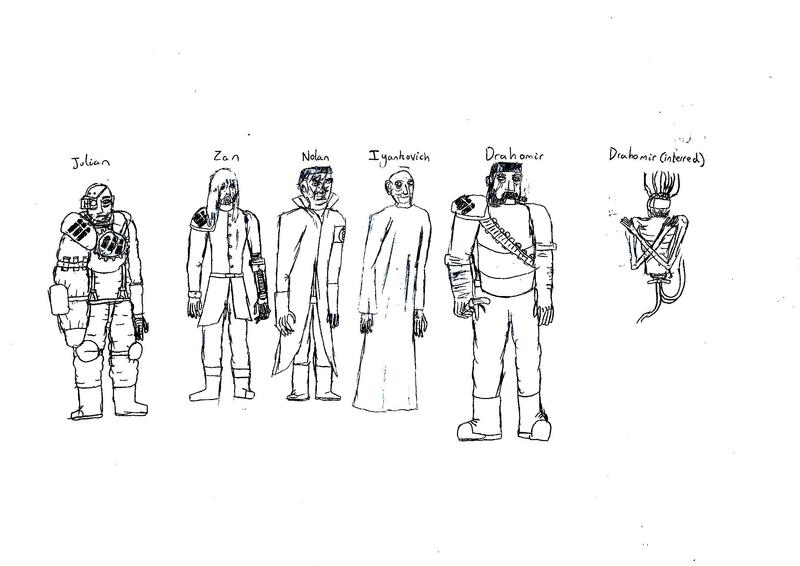 I've been busy and forgot to make a npc. Maybe you could notice them and ask if they have a team or would like to join? Appearance: Tall and lanky, with piercing hazel/yellow eyes and short, blue dyed hair. Often wears a black leather trench coat. Bio: An experienced Gunplar, he uses and builds only Astray frame gundams. Appearance: Astray Red frame, but the white is grey/silver and the red is a swirled mixture of yellow and orange. It has a large backpack with three large thrusters and two maneuvering thrusters, with 4 fins. Weapons: Beam Gerbera Straight (exactly what it sounds like), anti-beam coating, beam shield, and beam boomerangs. Abilities: God-slash: The beam of the Beam Gerbera Straight extends far into the sky, before slamming down upon any enemy gundams. (Much like the GBD’s champion’s move.) Beam Fortress: The beam shield temporarily expands around the entire gundam. Boomerang Boom: The boomerangs arc multiple times around/through the opponent before returning to the MS, as opposed to arcing only once. I'll just have him be in the battle, is that OK? Also, if you could have two NPCs play the other members of his team, that'd be great. My only request is that they use Astray Frames, as that is the main requirement of the team. Appearance: curly brown hair, short and skinny, wears causal wear and glasses, has blue eyes. Appearance: based on the gold-frame, Longshot is built light and, has a large wingpack resting on his back. 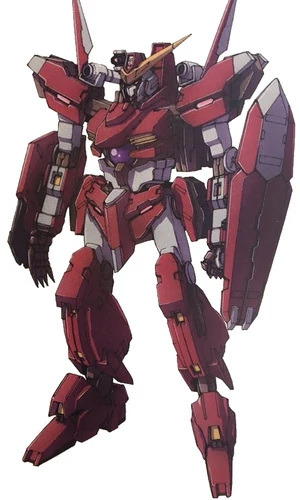 Appearance: A red frame and an out frame d were combined into an amalgamation similar to that of the amatsu. It is painted red and black, with red being the primary color. Sorry @TheOnlyGuyWhoLikesMistika but you aren't active enough to continue this rp. Suit; black with red detail Gundam virtue. Removed the backpack and cannons along with a custom inner frame that transforms into a support fighter / cannon when not in MS mode. Built so it's armor can combine with rayas Drive either with or without the twin strike combined as it's backpack. if I'm reading this correctly this is an armor that can combine with other MS? Cool. Also does it come with any weapons? Well it's been customized replacing the nadleeh inside with a transforming fighter forming a basic skeleton. Abilities and weapons; duel GN buster swords, quad barreled missile launcher, trans am like the rest of the team, extra thrusters. Appearance: Alternates between different color shirts and shorts, always wears the same flip flops. Has black hair and brown eyes, and fair skin. Bio: He's a decent enough modeler, but hasn't yet explored the realm of customs. He recently discovered the world of Gunpla Battle, and very quickly became very good with the model he uses. accepted, argh why haven't I seen this?? sorry for the wait. Appearance: a large man with black hair shaved to a buzz cut. Trans-Am System, greatly enhances the gunpla performance, causing it to glow red and after it's effect weakens the gunpla. Bit Control System, The Gundam Throne Vier features a Bit Control System, allowing the pilot to control the GN Fangs. Trans-Am Variable System, enhances certain aspects of the gunpla, though what was enhanced is greatly weakened afterwards, example. IF mobility was enhanced after the time limit, speed is decreased significantly. GN Cannons; Used mostly by assault-type mobile suits and some battleships, GN Cannons are very powerful beam weapons that can easily destroy scores of opposing units in one shot; while the beam is powerful, a similar blast of a sufficient diameter can used to deflect and/or neutralize it. GN Cannons come in many different shapes and sizes, and can be mounted on the body(Harute, Virtue, GN-X II, Seravee) or handheld(Arios GNHW/M, Nadleeh, Seraphim). GN Claws; Used only by the GN-X series of mobile suits, the GN claw is a razor-sharp manipulator hand whose destructive power can be increased via the field effects of the GN Particles. GN missiles; GN Missiles such as those used by Dynames and Cherudim are small, self-contained GN weapon systems. Each missile contains an electronics package to handle targeting and telemetry, a propulsion system, and a small GN Condenser. Particles provided by the Condenser coat the outer surface of the missile, enhancing its penetrative abilities. The missile's entire payload of GN Particles are released once the missile has penetrated the target's inside, destroying the enemy from inside out. GN Sword; The physical alternative to GN Beam Sabers. The blade is made of E-Carbon, giving it tremendous cutting power. Most GN Blades are coated with a GN Field on the surface to increase their sharpness. Thus, not only giving the blades even greater cutting ability, but they can also negate any GN Field. One disadvantage they possess compared to beam sabers is that the blades can be destroyed or wear out from disrepair. GN Fang Bits; The Vier possesses 2 GN Fangs which resemble clawed fingers when not in use. They are capable of piercing most armor, and are similar in role to the Arche Gundam's Fang units. However; they require periodic recharging to ensure their continued usage. These bits are located on the elbows of the gundam and look similar to spikes. No, it's concept art for a Gundam in 00 called Gundam Vier. It just was not used from my research. Bio: A notorious yet enigmatic figure from the Criminal Underworld, has ties to Cash and his criminal past. Edit: This character is not a pilot or anything, however he will affect the narrative of the Musicians and as a result I felt he should be included in the Signups. The Bit Control System is a system in Mobile Suit Gundam 00 that allows the pilot to delegate and control the remote bits/fangs of mobile suits. The field is created by concentrating enough GN particles within a local area of space. The GN particles are shaped and focused into a spherical form for full defensive coverage over the unit(s); however, the field itself is not restricted to spherical forms. The field itself can wrap around any shape or size, so long as the necessary amount of particles can form around the surface it was generated/formed over. When the GN particles concentrate enough, the particles become dense enough to resist intense temperatures, physically repel and/or stop ballistic weapons and particle beams. The strength of the field is reflected by the particle's color intensity. The brighter and thicker the particles over the unit, the stronger the field is. Depending on the strength of a particular field, it may or may not be penetrated by ballistic attacks. While the field provides considerable defense against most threats, it can be overwhelmed by an opposing particle beam that is proportionally stronger than the field. The GN Field maintains a specific particle compression rate to sustain the field and particle beams of a specific strength relative to the field's compression rate can easily eliminate the field. In addition, repeated powerful beam attacks on a single section of the field may also cause the section to be penetrated. This suggests that GN Fields suffers cumulative damage/deterioration after each attack if the field cannot replenish GN Particle counts and maintain field's particle density fast enough. In a two Drive configuration with a regular setup, the total amount of particle output is simply double of a single GN Drive because the number of Drives has doubled as well. However, with a 2 Drive machine using a Twin Drive setup, the resulting particle generation is not double of that of a single Drive but instead is squared that of a single Drive's output. This happens because of the synchronization of the 2 GN Drives, which allows the Twin Drive System to achieve such high particle generation rates. It is unknown how synchronization percentage between the Drives affect the total actual output of the particles. However, a minimum of 80% synchronization between the two drives is needed for the Twin Drive to function and the squaring of particles to initiate. The Trans-Am System temporarily increases its GN Particle output beyond normal parameters for greatly enhanced combat performance but it's not limitless and when its worn out its effects weaken the gunpla. 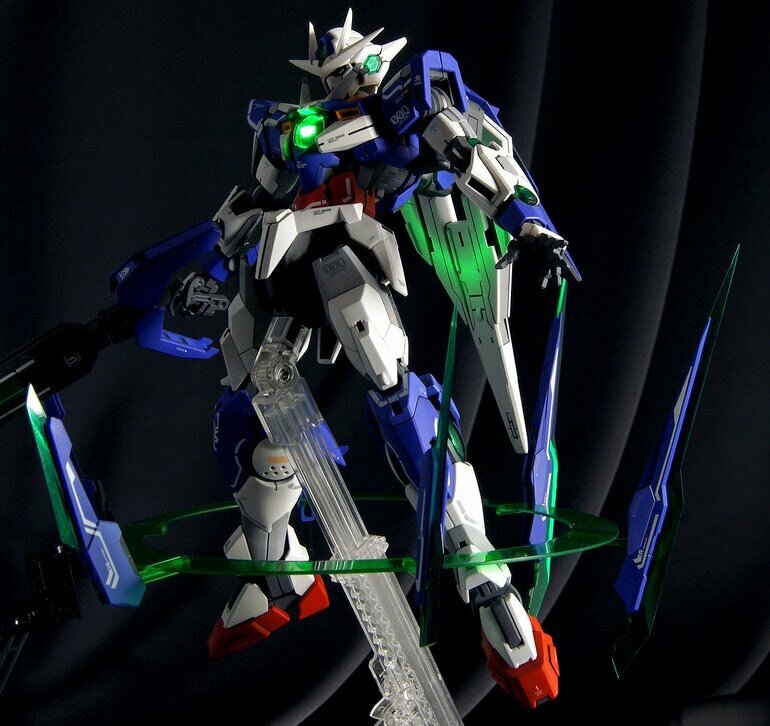 Qan T also has the Particle System which can be noticed by the Gunpla's overall green translucent color and it also possesses the Assimilation Ability causing the Gunpla and the Pilot to become as one and more powerful, and also has the ability of a Particle Burst attack, while in itself it is a strong Ability if it's combined will every arsenal the Gunpla has it makes of a one devastating finish move but not without its drawbacks. While the Gunpla significantly becomes stronger, if it were to be damaged that damage will be taken as well by the Pilot, the worse the damage the worse could happen for the Pilot. Stored on the GN Shield are six GN Sword Bits, of which there are 3 different types: A, B, and C. A Bits are the longest, B Bits are medium in length and C Bits are the shortest. All the Bits are usable as remote-controlled weaponry, or as hand-held swords as they contain hidden handles. They also possess many attacking roles in Qan[T]'s arsenal such as attacking individually or forming up as a whole set with the GN Sword V to become either a buster rifle or a buster sword. In addition to offense, the bits can also create a GN Field when positioned together in a circle and their defensive capabilities become high. As you can see in the image they can combine and form that form, which can fire a powerful particle blast or can form as a blast booster, meaning if Qan T fire its GN Sword in Gun Mode the blast will increase 2 times stronger than before, the same is with the buster rifle and buster sword when Qan T does a particle sword slash or beam or goes through it increasing the thrusting capability, in all said this all can destroy one gunpla with a one strike by using the buster sword or rifle but not the GN Sword or Rifle, it might cause serious damage but not outright destroy it. And when the Qan T is in its Particle System Mode the power of any attack increases 3 times stronger than before, being able to destroy 2 Gunpla in one strike by using the buster sword or rifle, while the GN Sword might be able to destroy one Gunpla. To be noted: While this Qan T is red and silver and has cyan blue instead of green this is just an image to explain it better and it's like that because the artist didn't provide such a feature. A shield binder on the left side of 00 Qan[T] that is connected to its backpack via the same mechanism as 00 Gundam's "Drive Arm". Other than possessing 00 Qan[T]'s other GN Drive underneath, it also acts as the storage and quick-recharge unit for the GN Sword Bits when they are not actively used. There is also a beam gun with variable output mounted on top of the shield for missile interception purposes. The shield possesses a panel that reveals the GN Drive unit when opened, large amounts of GN Particles can be released from this point. 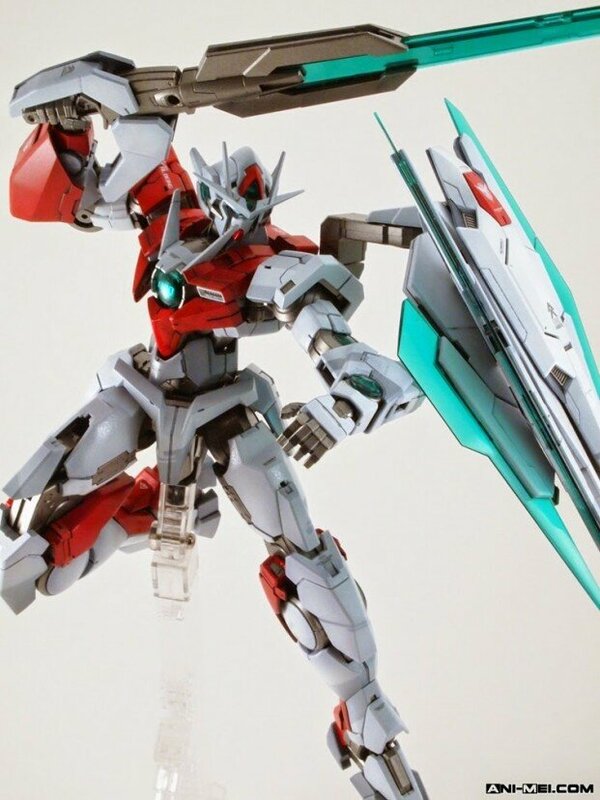 Because GN Particle emissions are known to have defensive properties, it is theoretically possible for the shield to use these emissions as defensive measure similar to 00 Gundam, although it is never seen as itself is already a very robust solid shield, capable of blocking shots from ELS Baikal. The shield can also swing to the rear of 00 Qan[T] and make the two GN Drives physically connect with each other. When the Sword Bits are deployed, they are expanded toward both sides of the GN Shield, and simultaneously fly towards the locked-on target. The 00 QanT's primary weapon. It is fully made from the green material used to make GN Condensers. The beam output of its rifle mode is variable. It possesses two modes: Sword Mode and Rifle Mode. In conjunction to an ordinary rifle mode, it can also combine with the GN Sword Bits to either form a buster rifle or a buster sword depending on the formation. 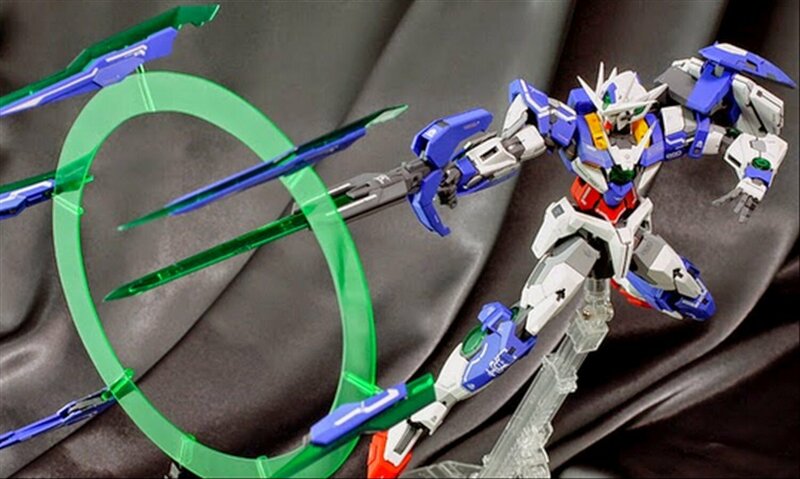 With all six GN Sword Bits attached to the sword in its buster rifle mode, 00 Qan[T] possesses the ability to create a large beam saber similar to the Raiser Sword while in Trans-Am. When not in use, it is then stored on Qan[T]'s left waist. 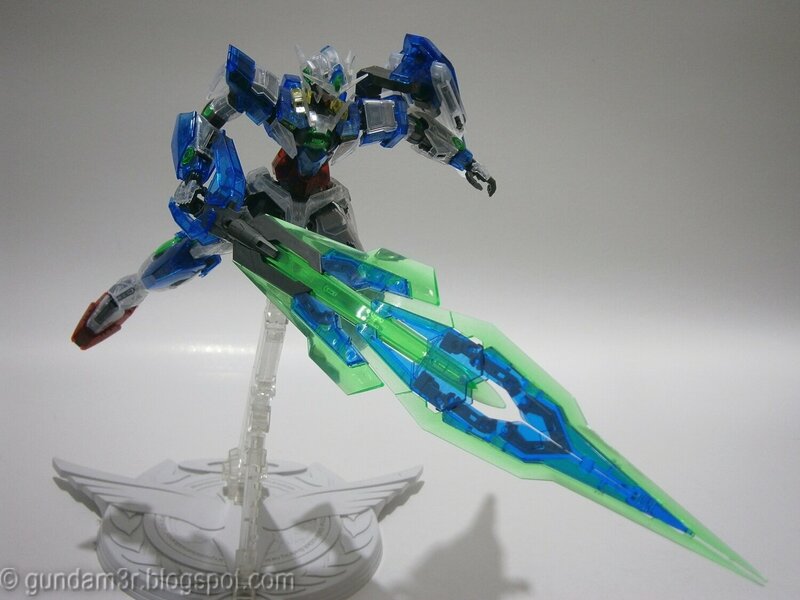 The GN Sword in its Blaster Mode while the colors might not be the same that's how it should look. This is how the Buster Sword looks. And this is how the Buster Rifle looks. The Buster Sword or Rifle Mode are in itself a strong weapon, being to cut through a Gunpla's arm or torso with a strike or blast. While not completely deadly it can pack a serious punch. 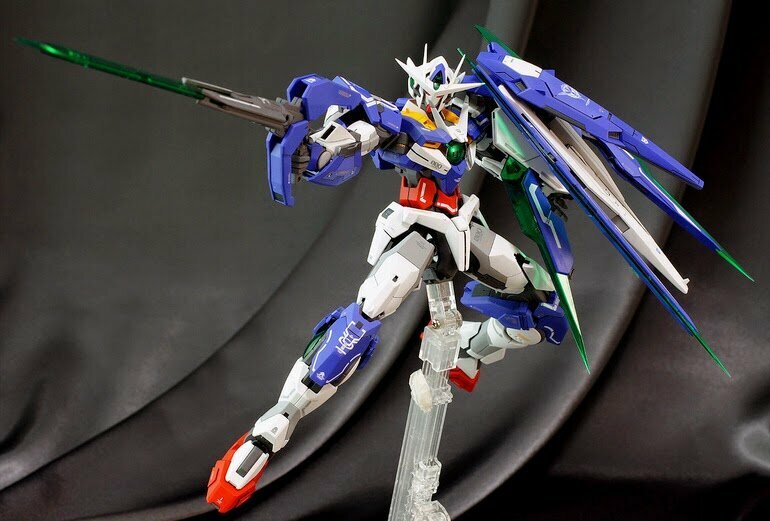 However, if the Buster Sword or Rifle are boosted their power increase significantly being able to destroy one Gunpla in a strike or blast, in Qan T's Particle Mode the Buster Sword or Rifle can destroy two Gunpla and its Burst Mode by using all of the Qan't strength destroy 3 Gunpla in one shot, however, the drawback is that the Gunpla itself takes damage for it unleashes an incredible output of power. @Jcton Okay, I hope I explained everything in a fair way and that I have made this fair, I hope.